Everyone knows this well-known Actor who has been seen numerous times as a guest in one of the best popular TV Shows Three’s Company. Jeffrey Tambor has been on (Transparent Amazon Prime 2014). He will be honored as well on Feb 22nd for the Premiere Post Oscars Party. 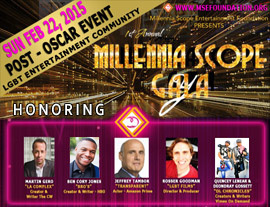 Get your tickets today there are more honorees and supporters as well. Please see all of his work on m.imdb.com/name/nm0001787.